Hangleton FC was created by lads from the Nevill School in 1962. This is the first ever photograph taken of the team who successfully won the Sussex Sunday League 3rd division in their first season. They subsequently continued with former Nevill School pupils to reach the SSL Premier division. Missing from the photo are Eric Dore,Club Secretary, who took the photograph, plus two key players Andy Lawson and Tony Burridge(Budge). Unfortunately contact with all the players has been lost over time, but they were great days from a time. We were all playing collectively in Hangleton Park from the late 1950s, the park was a haven of good footballers. Do you recognise yourself or anyone else in the photograph? Did you follow the team? If you can share your memories with us, please leave a comment below. I often used to watch Hangleton play at Wish Park. I remember many of the players in the photograph and also recall some of the other players who were part of the team when it played in the premier division, eg David Barcock, Barry Philpott, David Evans and Phil Elliott. Games against top premier sides such as Newick Rangers regularly attracted good crowds to the park. Reading these comments bring back brilliant memories for me. I was playing county league once with Haywards Heath at the time, after my return from playing at Bournemouth F.C and I will honestly say that my time playing for Hangleton in the Sunday premier,was special. A really smashing footballing side and great people to be involved with. Thanks John for introducing me, it will never be erased from my memory. The above piece should have read ‘Haywards Heath in County one not once’. My apologies and a very merry Christmas and a Happy New Year to all. Hi John, Perhaps I didn’t want anybody telling me that I was silly in turning down a full time contract with Bournemouth. I was offered an 18 month apprentice pro contract but turned it down due to illness at home with my Dad. Yes I remember the Courthope days very well as it was myself, Phil Abbott and Wally Thompson the leader, who got us into the Sunday league as’Portslade United’. I don’t remember Theresa but I do remember Jackie Reed. Andy Lawson was a delight to play alongside,I think he moved to Canada didn’t he? Good times John! Have a very Happy New Year. John, it’s Graham Richardson (in Keighley) inviting your call to me. You can reach me on graham@ftl-roper.freeserve.co.uk (A1 Roper Ltd) and I look forward to your call. My chance enquiry led me to this site. I was playing for Whitehawk Athletic, in 1970, against Hangleton, and I broke my leg in two places and Hangleton’s goalkeeper, Geoff Silverlock, severely damaged his back. I remember it was pouring hard, and the game was abandoned halfway through the first half. I played for Hangleton during the 1960s and do recognize everyone in the photo – it brought back some great memories. I spotted Keith Smith in a recent Brighton & Hove Albion supporters’ video. Unfortunately, I have lost touch with everyone now. The gentleman second from the left in the back row, Kenny Norris, is my father. I was just seeing if I could find any old stories or pictures of him on the web as sadly he passed away a week ago today after a short battle with cancer at the age of 68. He always spoke fondly of his time at Hangleton United. I believe my Pops (grandad) was the sponge man and team meetings often took place in his living room! Hello Paul, I don’t know you myself but I knew Kenny (your Dad) very well as I played in the Hangleton team with him in their premier league days. I am sincerely sorry to hear of his death and I am sure he will be sadly missed. He was an extremely nice person and a very good footballer too! Many thanks Dave, by all accounts it was his association with the Hangleton team that put him on the straight and narrow. I have fond footballing memories of him. I manage a local club myself now, using a lot of the wisdom he taught me! That’s nice to hear Paul, I wish all the very best to you with your club. Hope all goes well! Very sorry to hear about your dad’s death. I had not looked at the site for several months and was quite shocked to hear of this very sad news. Ken and I were quite close friends during our teenage years. We lived opposite each other in Beeding Avenue, so we were playing football and a little bit of cricket together in Hangleton Park from quite an early age. He met your mum during those early days with Hangleton FC and as you probably know those heady days of going out together in Brighton tailed off fairly quickly. Most of the lads in the photo went around as a group, as we were tightly knit living so close to each other, hence the formation of the football team. I was your dad’s best man when he married not that I was particularly good at it, but I do remember the big day. I suppose the disappointing thing is how in your twenties old school mates can drift apart as marriage, children and work takes over, but fond memories of those early days can never be erased. Hi all, I am Barry Phillpott’s son and found great interest in this page. Although I wasn’t born when dad played for Hangleton, his brother/ my uncle Trevor kept a scrap book of clippings, photos and articles. If anyone is interested in these I can scan and email them? As John Strickland has stated above Hangleton FC in their first season of the Sunday league won the third division title. We also that season reached the final of the Sussex Sunday League Cup which we lost by the odd goal to Piddinghoe, the match being played at the Newhaven FC ground. The Piddinghoe team playing that day: M.Cullen, G. Allen, D.Sargent, K.Denyer, S.Myall, B.Patten, D. Newham, D.Standing, R.Pavey, C.Newsted, B.Savage. The Hangleton team playing that day: J.Williams, M.Wade, B. Phillpot, D.Barcock, C.Muckle, B.Brewster, K. Norris, A.Beatie, R.Hynam, A.Lawson,K.Hill. Piddinghoe were in the top division and had a number of top quality players so we did well as a young side to give them a good game. I, as the Hangleton left back on the day, had the difficult task of marking Barry Savage, a quality player who the following season I believe turned pro, signing I think for Fulham. Hangleton FCwent on to win the SEC. 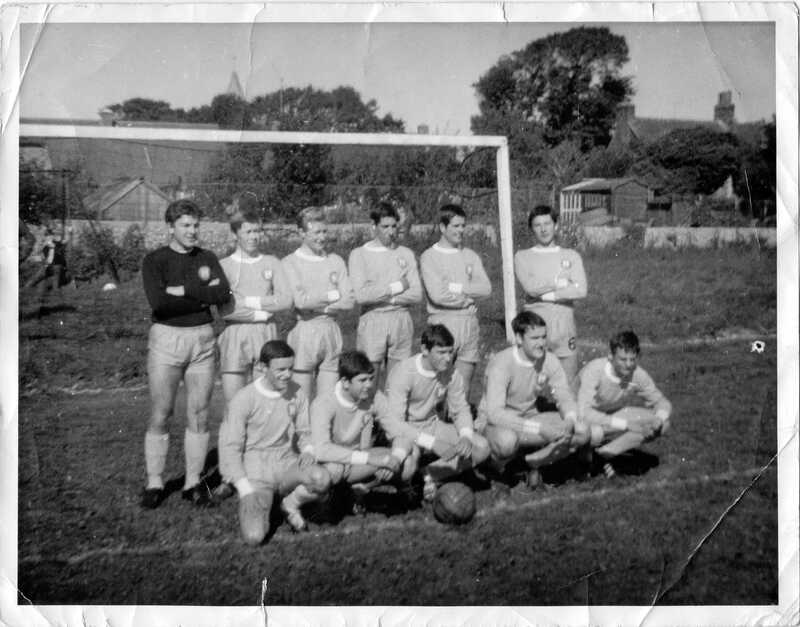 DIV.title in season 1966-1967 and were runnes-up in DIV. 1 in season 1968-1969. At this point in the clubs history we had attracted a number of players who did not originate from the Nevill School. As John and Dave have stated these were happy days shared not only by the players but also the families of the boys. Regards to all of the many good friends I shared these youthfull days with. Hi Ken (Hill), good to read your comments today. The game you mention is well set in my memory! I think we could have won on that occasion but we ‘tired’ a little. I still remember all the lads in the team and wish it could all happen again, super team and super times. Best regards. Have only just thought to check back onto this page, it’s nice to read about so many fond memories. If the scrapbook mentioned by Paul Phillpott is still around, I’d love to take a look. As well as Ken being my dad, my uncle Barry Brewster was also in the side. I’m sure he’d like to take a look too. Paul (Norris), I agree with your comments and I too would dearly love to look at the afore said ‘scrapbook’. John Strickland, it’s Graham Richardson (in Keighley) inviting your call to me. You can email me on graham@a1roper.com and I look forward to your call. My chance enquiry led me to this site. Hello everyone, just wanted to let you all know Eric Doré is my Dad. He and my Mum moved from Sussex to Suffolk around 10 years ago. He and my Mum (and us children & grandchildren) will be celebrating his 70th birthday with him in Suffolk next week! He has fond memories of his time with the club and football is still a massive passion and interest in his life. I’m sure he would like to hear from former members – do get in touch. Hello Julia, it is always nice to hear about people and friends from the past etc. I remember your dad very well having played for Hangleton back in the day. Please give him my regards and wish him a happy 70th birthday, I have reached that ‘milestone’ recently. Kind regards. I played for Hangleton after playing for Alpine Rovers, was a bit like transfering from Rangers to Celtic. Great rivals in late 60s/70s. Played to Hangleton in Sunday Prem. When we played home games at Wish Road, had to be an enclosed ground so we had rope all the way round to comply. 2nd Team v Maresfield Res 3pm ko J.Williams, K.Norris, R.Feeney,R.Greed,M.Salisbury,K.Booth,B.Smith,S.Calderwood,J.Hewitt, A.Beattie,J.Harmes. sub. J.Ayling. Notice keeper J.Williams had to play in both games that day.